The Norfolk Regiment was the county infantry regiment. However, men from other areas could join the Norfolk Regiment and men from Norfolk found themselves in regiments from around the country, particularly during the rapid growth of the British army during the First World War. During the First World War the Regiment had two regular battalions, three service (or Kitchener) battalions and two territorial battalions on active service abroad. The 1st Battalion crossed to France with the British Expeditionary Force in early August 1914. It served on the Western Front, and was joined by the 7th, 8th and 9th (Service) Battalions in 1915. The 2nd Battalion served in Mesopotamia, while the 1/4th and 1/5th Territorial Battalions fought in Gallipoli and the Middle East. There were also a number of battalions used for training and home service, such as coastal defence. The Royal Norfolk Regimental Museum looks after a wealth of objects relating to the Regiment. Many of these objects are on display in Norwich Castle Museum, including army uniform, kit, personal letters and diaries that reflect the daily lives of soldiers in wartime and peace. Gallantry and service medals are also on display, along with details about the men who won them. Behind the scenes a small team of staff and volunteers care for the collection, and have a wide range of knowledge and expertise. In our archive we hold a large number of First World War documents including official war diaries, battalion orders and recommendations for awards, as well as more personal material such as letters, diaries and photographs. 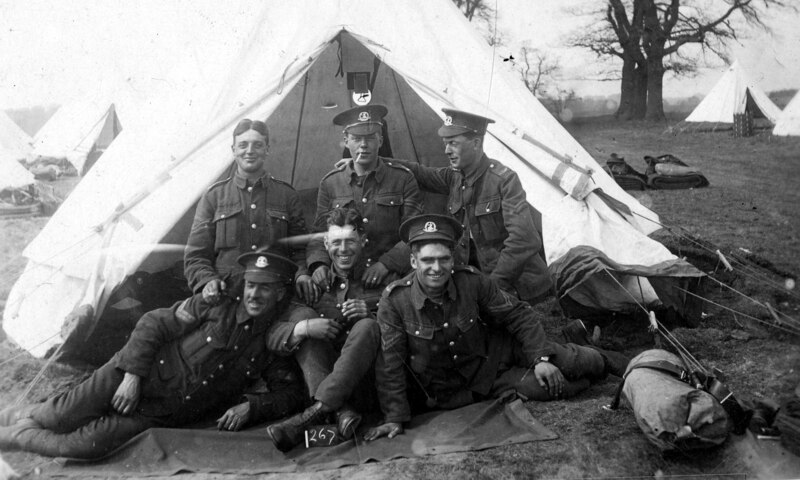 As part of the First World War centenary commemorations, the RNRM will be providing family history research sessions at Norwich Castle Study Centre for those wishing to find out more about the soldiers who served with the Regiment in the First World War. Please contact us on 01603 493625 for more information and to book a place. Hi, my great Grandfather Charles Edward Norgate was a Lance Corporal in the Norfolk Regiment during WW1. I’m trying to find out about him, is there any way you be able to help me? many thanks for getting in touch. While I am sure that the staff in the Royal Norfolk Regimental Museum will be able to help you more with this they do ask that people write to them at the office as they do receive a lot of queries like this. The address is The Royal Norfolk Regimental Museum, The Shire Hall, Market Avenue, Norwich, NR1 3JQ. I am sure that if you do write to the Shire Hall they will find some more information for you. Hello, I have a history project about a soldier from WW1 and I am trying to find out about a soldier from my village (Comberton) named Frederick James Butler who was in the 8th Battalion of the Norfolk regiment, if you have any information about him and his life before and during the war please could you contact me. many thanks for the query regarding the soldier from your home village. If you can send your query, and as many details as possible to the team at the Royal Norfolk Regimental Museum (regimental.museum@norfolk.gov.uk) then one of their researchers will look into him for you and hopefully be able to give you some more details. Many thanks for contacting us and good luck with your research. To day 100 years ago my grandfather Private Albert Holmes died in Hospital in the Baghdad where he is buried in North Gate cemetery. Sadly the family have never seen a photo of his grave and never been able to afford the trip to Baghdad to see it. Where any photos taken for the wifdows or relatives of those killed or as in our case died of illness during the conflict. All we have is one photo of soldiers in the desert, and as they were all wearing beards no certain which is my grandfather as only a couple of other photos ever taken of him. I am trying to find info about a lady who was killed in Sheringham during WW2 air raids on 22nd September 1940. Do you deal with queries regarding 2nd world war, if not can you suggest someone who does? Thank you. apologies for the delay in seeing this comment, we aren’t currently researching WW2 but if you can pop into your local library they should be able to help a little with your research, especially if you do have a name. Many records dealing with WW2 are still ‘sealed’ but if she was born before 1911 then we maybe able to find some leads. The Norfolk Heritage Centre also has many of the local newspapers on microfilm and there maybe information to be found there too regarding the actual air raid. I hope that this helps a little? I would like to know if he has a grave, or is he commemorated on one of the war memorials. Hope you can help me out. He was writing to my Great Grandfather from the Front, as they were good friends, and I have a couple of the letters which he sent to my Gt Grandfather. I am an ex Royal Anglian myself, and RAF Regiment Gunner, so I have a lot of interest to find out about him. He may have been mentioned in material held at the Royal Norfolk Regimental Museum. If you email regimental.museum@norfolk.gov.uk with as much information as possible about Edward George Earl, they will be able to see if they hold anything of interest. Please bear in mind that they are a very small museum with only one permanent staff member, so replies may not be immediate. There seems to be a lot of detailed information here which is very interesting. I got interested in the Middle East conflicts a while back and have found some good books available. I decided to concentrate on the Norfolk Regiment and the 4th and 5th Battalions in particular. Having collected a few bits and pieces I have restored a trench watch that belonged to Captain R B Caton of the 4th. He was awarded the Military Cross in the 1918 New Years Honours, presumably for his service in Palestine and maybe the Battles for Gaza. Does anyone have any information on his MC award, I have found a lot of family information about him. I have not much on Caton that is useful I am afraid. He is not mentioned at all in Petre’s 1925 History of the Norfolk Regiment. Gaza II April 1917 MCs were announced well before Caton’s award was gazetted so I think he cannot have earned his at Gaza II. My guess is that it was a Gaza III award or, less likely, for D Company’s action at Stone Hill, 12/13th Dec. However, the Bn diary names another officer as leading D company’s attack that day. Harvey (1920, unpublished history) lists Caton and Eden Burrell as the only officers to land at Suvla and serve, unscathed, with the 4th Bn to the War’s end. There is no other mention of Caton by Harvey. Caton did not attend the first 4th Bn reunion dinner in Nov 1919 and was not a member of the newly reformed 4th Bn in 1920 (whereas Jewson and Flatt were and remained active in the Norfolks until the 1930s). I did find a Gazette entry for Capt Caton announcing that he had aged out on 7 March 1936. What was his background? Can you post a photo of him? Thanks very much for your reply. I am quite a novice at researching and have found very little military information about Capt Caton. I do not have a photo. I do have copies of the Gazette for his promotion to Lt, Captain and his Military Cross, but little else. I thought that getting through the war alive, in the same Battalion and receiving an MC would be enough to find some reasonable information. Comes from a family that had people in senior positions in the Church. His father was rector at Fakenham and has his name appearing in several church based activities. His full name was Richard Bewley Caton. His own home was West House at Bacton, after the end of WW1 he is mentioned in several newspapers reports on flower shows, and opening local shows. I have tried all those connections without any luck. I became a little intrigued because his family background had to go a long way back for any military connections and the absence of any Norfolk Regiment information made him seem a mystery man. As I said in my first post, I have become very interested in the Middle East part of the Great War as it seems somewhat overlooked historically, Captain Caton was a focal point but it looks as if I shall have to find another, but through him I have learnt a lot about the conflict with the Ottoman Empire. I don’t know how to post a photo here but I have a summer 1915, 22kb image ofthen 2/Lt Caton snipped from a photo of all the 4th Bn officers. Rob. If you send it to our email address we can add it to blog for you. That would be great if you can get it added to the blog. Thanks for your continued help. I have found that Richards Caton’s great aunt was married to a Lt. General, so some military connection after all. I do not know any other people in the photo other than my Grandfather . But if you would ;like a copy just send me your e-mail address to michaelbrowne37@uwclub.net and I will send it by return. If you have an idea what he looks like this photo is well focused, and blows up well. My grandfather, Private Arthur Joseph Spraggs, of 1/4th Norfolk, died of wounds 22 December 1917 and is buried in Kantara cemetery. His service no. is 31046 and he was part of the Egyptian Expeditionary Force. I have a picture of his grave sent to my grandmother, but as my mother was only 18 months old when he died, I know nothing more. I would love to learn more about where and in what action he was fatally injured or anything else. The 1/4th Bn was not in action the day your grandfather died of wounds. These were probably sustained on 15th Dec 1917, when 2 Coys of the 1/4th Bn attacked Stone Heap Hill. If so, this may be what you are after. …a rocky feature overlooking the plain on the west, and flanked on the south-east by a smaller hill known as Sanger’s [sic] Hill. These two were joined by a rocky saddle 200 or 300 yards long. From the west point of Stone Heap Hill there ran, nearly due south, a spur stretching almost to the village of Deir Turief and ending in olive groves surrounding its foot. Between this spur and Sanger’s Hill was a fairly deep depression, forming a watercourse which joined a wadi at the edge of the olive groves. The attack was to involve about 250 men led by Capt Back and Capt Bernard King. It began at 08.00 h with D Coy to the right, A Coy to the left, C in support and B in reserve, with the 1/5th’s two companies still in support of the 1/4th Bn. The attackers assemble in a cactus garden northwest of Deir Tureif, about 1500 m from Stone Heap Hill. The left wing of the attack was to pass over the spur and the centre and right wings headed across the depression over the watercourse. It may have been a dry stream bed; it is not clear. Immediately machine guns on Stone Heap Hill ahead to Sanger Hills to the right opened up on the attacker, particularly the right flank. C Coy moved from support to the centre between D and A Coys. The attackers already moving at pace, under fire and in the open were forced to speed. D Coy on the right to swing around the saddle. Sgt S Beale single handedly captured one machine gun by killing its two man crew. He was also commended for his care for the wounded during the fire fight. Capt King was commended (so says Petre, but based on what he does not say) for his cool leadership. L/Sgt George Wardropper and Pte Bates, King and Andrews were likewise commended for their bravery during the attack which took the crest of the Hill by bayonet and at a charge. The Turks were driven off, relentlessly northwards. Accurate and for the time being, close range, Turkish artillery prevented the new owners digging in and they were forced to rely on natural features for cover. Meanwhile, to the right of the 1/4th Norfolks, the 1/5th Suffolks had taken Sanger Hill (Kh. el Bornat to the locals), securing the day’s objective’s. The Turkish battery that prevented movement in the open on Stone Heap Hill may have been located about 600 m to the north on a low rise overlooking El Tireh. In any event, the 1/5th Norfolks were given the job that afternoon of taking the rise. Two companies were sent forward from the Brigade Reserve. With their stretcher bearers and two platoons in reserve on Stone Heap Hill, the other company and a half advanced along a low ridge line joining the start point with the objective. Turkish fire from three sides was rapidly and effectively suppressed by allied artillery support. The hill was taken with 2 dead and 7 wounded. It was held with no further casualties that day. After the action, the 1/4th battalion remained in camp on the plain of Sharon until March 1918. On 26th December 1917, Pte Walter Tunaley 200360 (my great uncle), arrived at Kantara Hospital with gunshot wounds. If he was wounded at Stone Heap Hill on 15th December, the 1/4th Bn’s last action, 11 days would have elapsed. When L/Cpl GJ Dury 25774 1/4th Bn was wounded on Tuesday, 27th November, he reached Kantara on Saturday, 1st December, just four days later. If you were up for up for sharing a copy of the image of your granddad’s grave or even of him, I would love to see it. Hi John, I’m not sure if this is still active but my Grandfather’s uncle Charles Payne was in Belgaum in 1911 and from there to Mesopotamia. I have some wonderful photos including one, it appears of the whole regiment, another where they are actually knitting socks, setting up a cooking tripod in Piranwadi etc. Perhaps the regiment may be interested in copies of our material? Charles returned to live in Mistley where he was born. Hello Amy and Philip Seale. I too am looking for more information on Company Sgt. Major Philip Moore, who was my great-grandfather. I tried to reply to your posts earlier but not sure if I was successful. I visited his grave this week and took some photos of Caterpillar Valley cemetery. I’d like to know more about his service during the first two years of the war. Hi Amy, Philip Moore was my great grandfather. I visited his grave at Caterpillar Valley two days ago and have a few photographs of the cemetery and the memorial. I’m just starting to trace the family history. Hi unfortunately I’m unable to attend the history sessions in Norwich. I’m very interested in finding information about my great uncle Company Sargeant Major Philip Moore, no 4754 Ist Battalion who died in Flanders on 27 July 1916. Any information you have on his service I would be most grateful. Hi Philip. Sgt. Major Philip Moore was my great grandfather. I visited his grave at Caterpillar Valley two days ago and have a few photographs of the cemetery and the memorial. I’m just starting to trace the family history and would be interested in any information you have. Hello, I am searching for info.on Company Sergent Major Henry Robinson Pattinson No. 200010, who died 19th April 1917. He is remembered on the Jerusalem War memorial.and was a resident of East Harling. I cannot help you with your search but it is interesting that your HenryPattinson’s Reg No.is 200010. My grandfather who also died in the Middle East on 6th Aug 1918 had the number 200001. He had been transferred from the Suffolk Regiment when he returned from leave in 1916/17 did this happen to your Henry?. If you have a photo of Henry to compare you might be interested in a photo I have of a battalion of men (my grandfather is somewhere in there?) in the desert. Contact me on michaelbrowne37@uwclub.net If interested and I could send you a scan of it. Just reading your post my Great Uncle Private GEORGE ZACHARIAH BARNARD 200399, 1st/4th Bn., Norfolk Regiment who died age 25 on 19 April 1917 and is on the Jerusalem Memorial. Just wondering if he might be in your picture. Would love to hear from you if you think he is.. In 1912, E Coy of the 4th Norfolks, a territorial battalion that had its HQ and drill hall in Attleborough. There were detachments in East Harling and in Hingham. Your g/f was a NCO, so possibly senior enough to have been serving pre-war or possibly to be a former soldier returning to the colours. He was killed at the 2nd Battle of Gaza. This was the last occasion during the war that the 4th and 5th Norfolk battalions in Palestine were still made up largely of men from the county. Losses were high. The outcome a failure. In Neil Storey’s book on Norfolk’s territorial, “The Pride on Norfolk”, there is a picture of 4 sergeants, including Sgt Jack Dye of Attleborough. It looks to be taken before the battalion embarked for Gallipoli, possibly before 1914. It is a very very long shot but if Dye and your grandfather were pals, the image might be worth checking out. The image was provided to Storey by a relative of Dye. Hello Michael – thanks for your comment and apologies for the delay in responding. Staff at the Royal Norfolk Regimental Museum will email you with the information that we have about Albert Holmes. Following a message today I rolled down the page to see all the other comments in case I had missed anything of interest to me and I note the regimental mueum was meant to contact me But I have never received any information. Could the Museum look this up again please. I will not be able to attend the history meetings in Norwich, But I would like to know where when and where my grandfather went during the Middle East Campaign. He was Albert Holmes No 200001 originally from the Suffolk Regiment who died after being wounded on 6th Aug 1918 and is buried in North Gate Cemetery in Baghdad. If you are interested I have a photo of his battalion in the desert, although I do not know which is him in the photo. I have a relative (L/Cpl W Tunaley, 300360, 1/4th Norfolks) who may be on your image. Is there any chance please that I might get a scan to check out?. I have a relative (L/Cpl W Tunaley, 200360, 1/4th Norfolks) who may be on your image. Is there any chance please that I might get a scan to check out?. give me an email on michaelbrowne37@uwclub.net. and I,ll attach one by return.